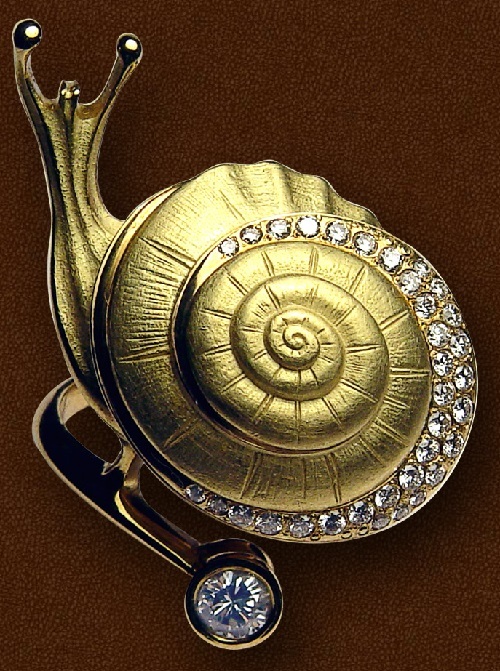 Inconceivable mesmerizing magic of mathematical snail spiral ring, a symbol of the evolution of nature and the whole of human history. Even in a small creature embodies the harmony and the value of the universe. 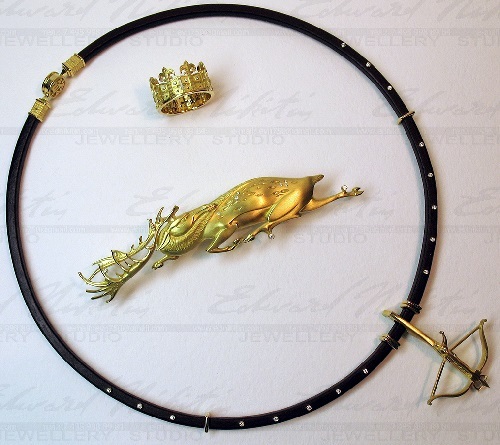 Russian jeweler Eduard Nikitin creates jewellery inspired by the mystery of past civilizations and mythical animals. 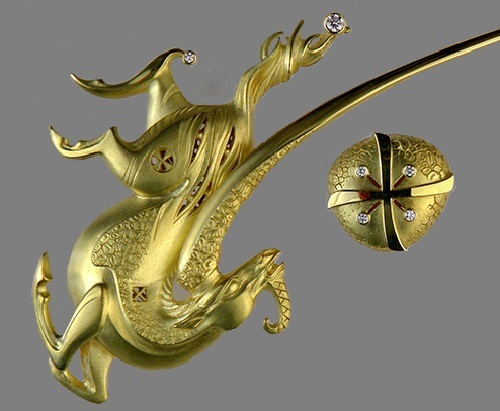 Moscow based jeweler Eduard Nikitin was born 2 March 1961, in Chelyabinsk. In 1981, he graduated from the Chelyabinsk Art School, Sculpture Department. Nikitin is a member of the Union of Artists of Russia (1989). 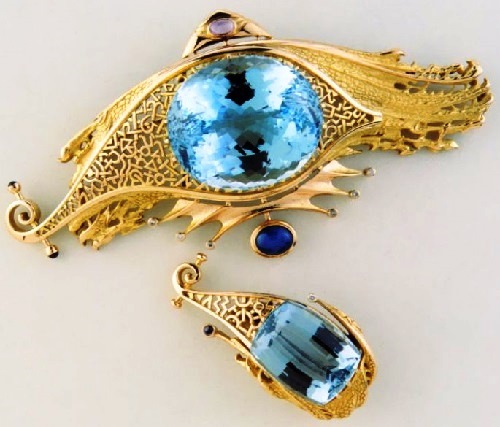 He has participated in International, Republican, and All-Russian exhibitions of jewellery art since 1980. 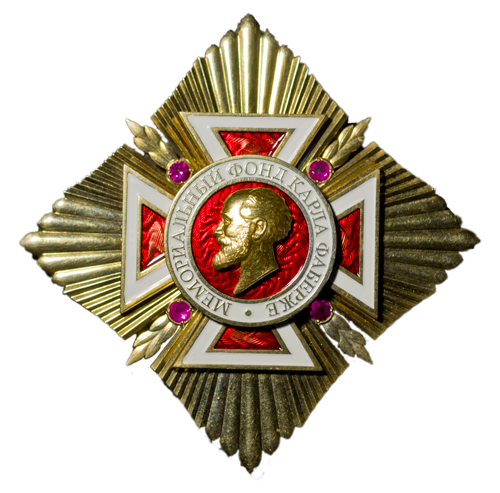 Eduard Nikitin was awarded Diplomas of Moscow international jewellery and watch exhibition “Jeweler-2002”, “Jeweler-2003”, the International Exhibition “Three thousand years of Jerusalem” (1996, Jerusalem, Israel), Medal of Rantanen Foundation (1989, Helsinki, Finland), the jubilee commemorative badge of Carl Faberge Fund (2011), Gold medal for 1st place in the competition “Jewelry Olympus” (2012), the order of Franz Bierbaum (2012). His art works are exhibited in Museums of Fine Arts in Yekaterinburg, Chelyabinsk, Helsinki, Prague, Haifa, and in private collections in Russia, Belgium, Germany, Israel, Finland, the US, Luxembourg. 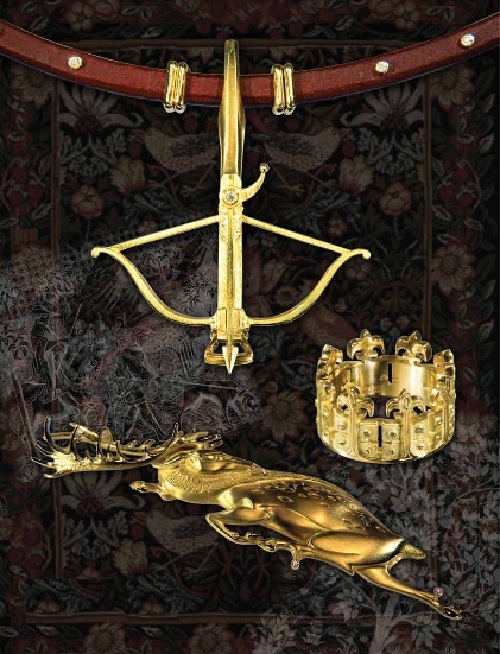 Jewellery set “Royal Hunt” is not just a set, the elements of it are located in a single ensemble. Nikitin created precious triad, pushing an imaginary space of events, distancing them from each other in the landscape of the body and the time of history. 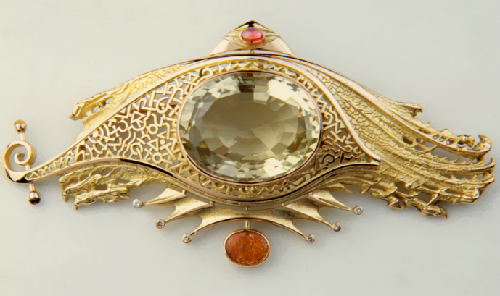 Necklace Treasures of Agra. 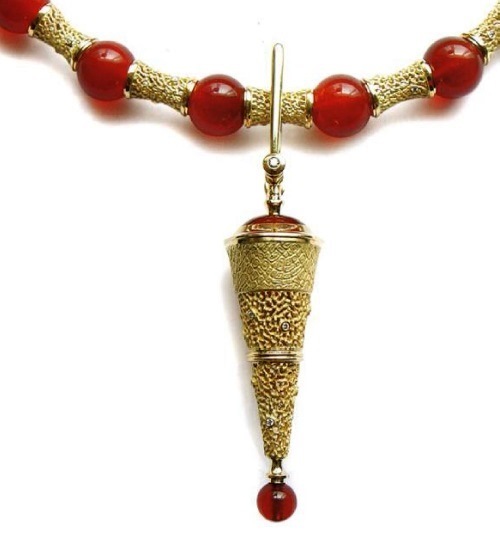 Gold 750 °, carnelian, diamonds. 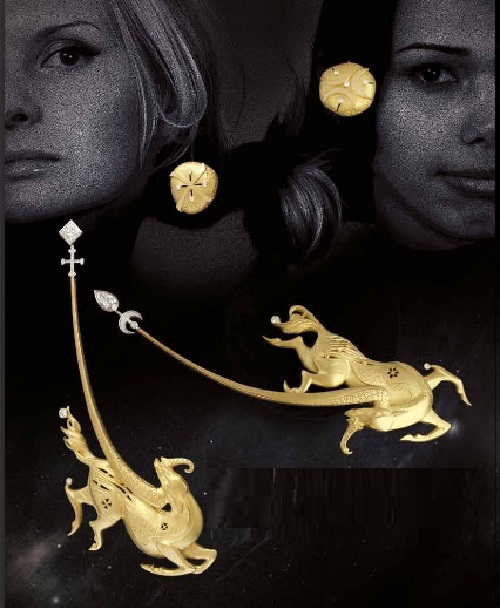 In 2010, work took first place in the competition “Golden Elephant”. Acquired by the protocol department of the Russian Foreign Ministry as a diplomatic gift to the wife of Canadian Prime Minister Mrs. Laureen Harper. 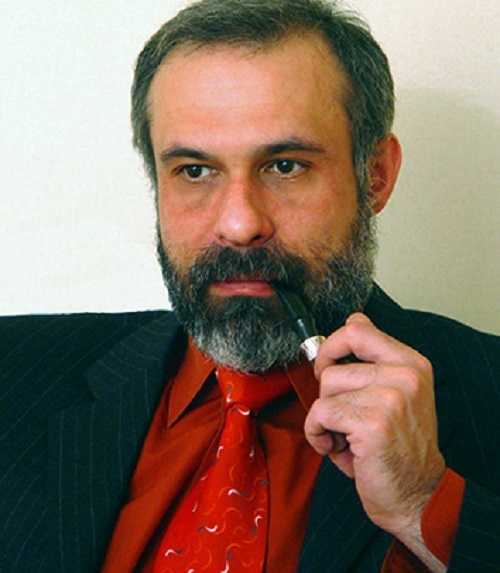 Eduard Nikitin says: “Ancient writings, magic signs, mythical animals, mystery of past civilizations – this elusive filament, which varies continuously over the centuries and times, can not leave me indifferent. 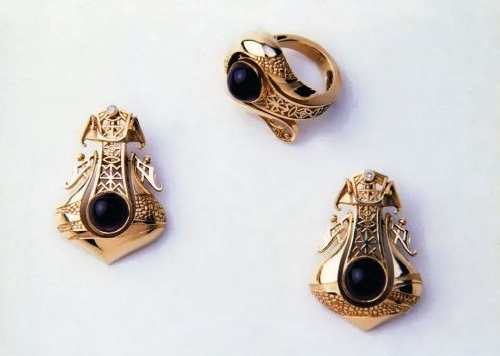 I was attracted by the eternal desire to express it in my profession, giving the sign and ornament new value. 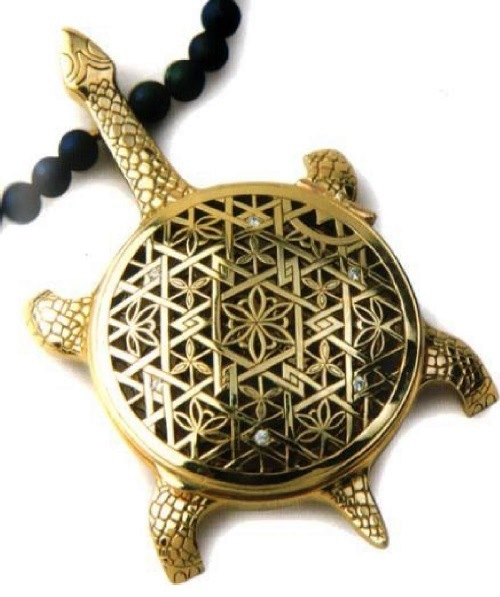 For the ancient symbol I chose gold and precious stones, and to express my feelings, I chose the decorations”. 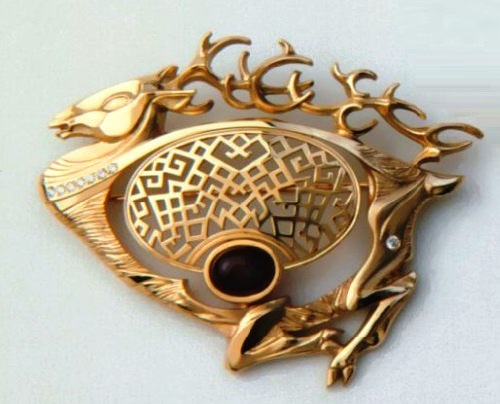 Brooch ‘Games of unicorns’. Gold 750 °, diamonds. More than 1300 years of confrontation between two worlds – Islam and Christianity. 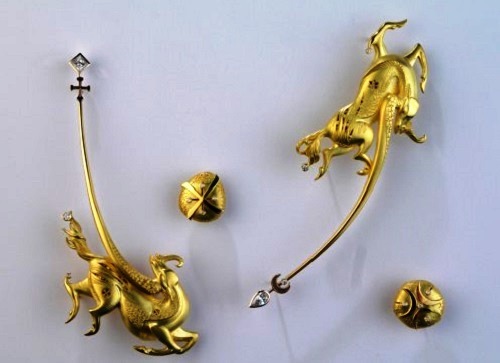 Two great religious and philosophical systems symbolically expressed in the figures of the golden unicorns, play with each other on the field of world history. 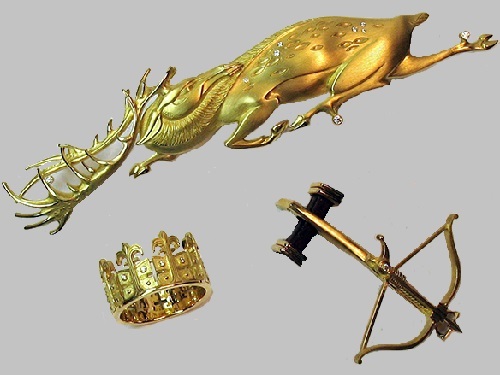 On how unicorns are located depends what their formidable horns will turn into – swords aimed at each other, and if parallel, – to the peacefully ongoing river of mutual respect and harmony.